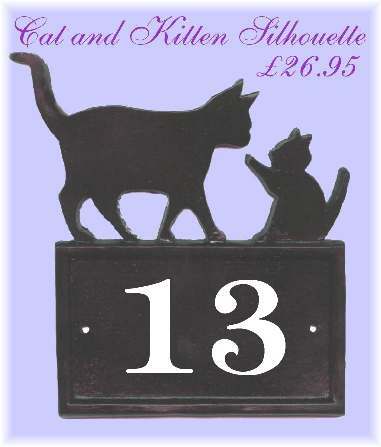 Our cat and kitten design house number plaque is inspired by old fashioned weather vanes where one would see an animal scene depicted in silhouette form. This silhouette stands out best fitted to a light coloured background such as white rendered walls, facias or on Upvc sash boards. Hand cast in reconstituted slate, the plaque is then sprayed with a tough black U.V. and weatherproof car paint finish to give that jet black weather vane look. We use modern acrylic car paint which gives excellent outdoor durability with no maintenance. This sign is suitable for one, two, three & four digit house numbers. We can also offer this design with a house name, but the writing will be quite small. The plaque is offered with a choice of several night-reflective fonts. If you prefer a font on your computer not shown on our font list, just send it to us as an e-mail attachment and we can then make this sign for you in that font. Night-reflective lettering is endorsed by Fire Fighters, Police and other emergency response departments in many Countries worldwide.